When kitchen linens get too close to a burner or very hot pan, you can end up with burnt fabric stuck to a pan. 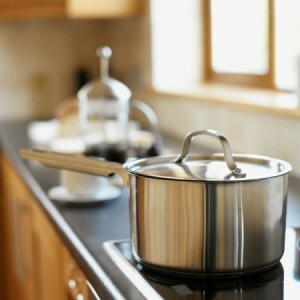 This is a guide about removing melted fabric from cookware. I just set a hot pan on top of a microfiber cloth, now I have melted microfiber all over the bottom of my good pan. Any ideas of how to get it off? I can't use the pan on the stove or it will ruin the stove too. Any help would be greatly appreciated. Thanks. Sounds like a bit of a nightmare, Sister G. I've not encountered this before and I do use microfiber cloths for a few things around the house. If you have a heat gun or even hair dryer, what do you think about trying to warm up that mess a bit and see if you can scrape it off with a putty knife? If it melted once onto your pan, perhaps melting it again will help remove it? I put a hot pot on to a piece of cloth unknowingly and now there are remains of the cloth on the bottom of the pot. How can I get them off? Try mixing a thick solution of powdered dishwasher detergent and hot water in a container large enough to set the pot in. Let soak at least overnight, and the stuck on remnant should scrub right off. You could also try saturating the cloth remnants with WD-40, let set a while, and then scrape off. I just successfully removed microfiber cloth from bottom of my searing pan. Patience first, used fingernail polish, WD40 and left in sun - then the razor blade and it slowly pushed off! Fingernail polish or fingernail polish remover? Thanks for the suggestions. I soaked it in boiling water (in the sink) and detergent, while also heating up the inside of the pot with hot tap water. I let it sit for around 10 minutes (two kettles of boiled water), then it scraped off pretty quickly with a utility knife. To get the tiny fragments that remained, I very quickly ran the knife back and forth over the area, which left it completely cleaned. I tried this, and it worked! I sat the pot on a produce mat, and when I picked it up, the circle of foam and fabric was stuck to the bottom. I let it soak overnight, just scraped the foam off while running hot water on it. Eventually, I was able to peel the cloth piece off. Phew, I didn't want to throw the pot away as it is part of a set that my Mom gave me. Thanks! Something on my stove was about to burn so I quickly pulled the pan off the stove and sat it on a microfiber dish towel to cool. The towel melted to the bottom of my good pan. How can it get that off? I've done this numerous times and I put the pan in the sink with ice cubes and then it just scrapes off. It's the same concept as gum but I think you can put in freezer too and it will come off. Success! I put a piece of parchment between the melted on microfiber pan bottom and a hot iron. Once softened i scraped it with a razor blade to remove. It took several repeated series of these steps. A hot water wash with a scouring pad after and the pot is ready to be used again.